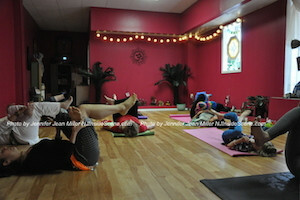 Guests at PEARLL Yoga's anniversary event take in a yoga class. Photo by Jennifer Jean Miller. 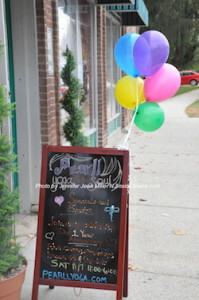 FRANKLIN BOROUGH, NJ – PEARLL Yoga for the Soul marked its first anniversary with a celebration on Sat., Nov 7. Balloons and the sign advertising the celebration beckon guests. Photo by Jennifer Jean Miller. PEARLL Yoga for the Soul marked its ribbon cutting on Oct. 18, 2014. Click here for that article. In its first year, the yoga studio, which is located at 91 Main Street in Franklin, has branched out in numerous ways with its classes. Not only are there yoga classes offered for all levels, there are a range of other programs. PEARLL Yoga’s yoga is a recent addition to the business. Photo by Jennifer Jean Miller. PEARLL Yoga for the Soul offers its Yoga for Survivors class on Thursday nights, a unique offering for women that helps women, especially those who are dealing with complex post traumatic stress disorder (CPTSD). 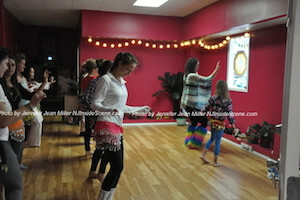 For Tween Girls, Belly Dancing is another weekly class that takes place at PEARLL on Friday nights. Coin belts jingled and hips swayed during the belly dancing event at PEARLL Yoga’s anniversary celebration. Photo by Jennifer Jean Miller. Baby and Toddler Yoga, a way for mothers to bond with their babies ages three months to two years, takes place on Monday nights. Also on Mondays is H.A.L.O. Yoga, an acronym for “Health,” spinal “Alignment,” “Lymph” movement, and healthy “Organs.” This yoga program helps to focus on these organs and body parts, for overall wellness. Meditation is another offering that was on PEARLL’s recent schedule, for a five-week period. There is a free open meditation class on Wednesday mornings. On Sundays, owner Keri Marino also teaches a free open meditation class on Sundays. That day, she also offers a free Vinyasa class for students that have a class card, otherwise, this class is $15 for those who are drop-ins to her studio. 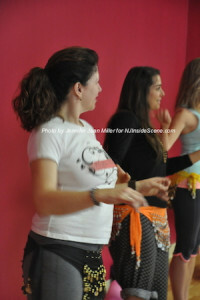 Keri Marino, owner of PEARLL Yoga for the Soul, participates in the belly dancing class during the open house. Photo by Jennifer Jean Miller. In its first year, PEARLL Yoga has established itself as a Reiki Certification center, plus a training center for the 200 hour yogaflow body and mind teacher training program. 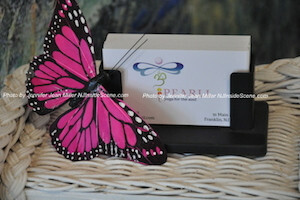 Click here for PEARLL Yoga’s special events and workshops page. Click here for the article about the Reiki and Yoga instruction programs. 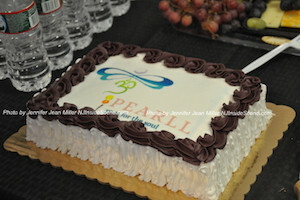 PEARLL’s celebratory cake. Photo by Jennifer Jean Miller. Marino started PEARLL with a mission as a survivor of domestic violence and cancer. New students pay $10 for their first class. The studio offers a loyalty program for all students, with discounts beginning after five classes. The discount can be applied to classes or to the gift store (which is open on Sundays and Fridays, click here for hours). PEARLL has a discount class program for veterans, seniors, students and DASI (Domestic Abuse & Sexual Assault Intervention Services) referrals. 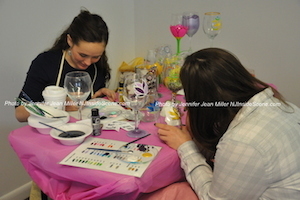 One of the vendors during the event with creates hand-painted glassware with attendees. Photo by Jennifer Jean Miller. By special request — the henna artist paints on a Puerto Rican Flag for one of the attendees. Photo by Jennifer Jean Miller. At Saturday’s anniversary celebration, there were free yoga classes throughout the day. Attendees were able to participate in a free belly dancing workshop in the afternoon. There were light refreshments and a cake to celebrate the studio’s anniversary. Guests could also have a henna tattoo painted on during the festivities. Vendors were there with special items for sale in the room across from the studio during the event. 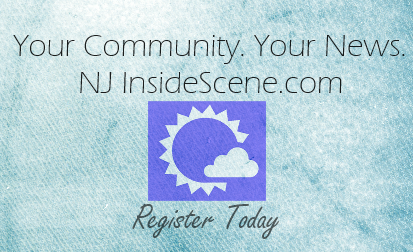 EDITOR’S NOTE: PEARLL Yoga for the Soul is an advertiser on NJInsideScene.com. To advertise, contact: sales@insidescene.com or (862) 354-1675. Stay on the scene with Inside Scene. Like this story? Click here to follow all of our stories on Facebook.